When I think of Chinatown, I think of thick sweaty crowds amidst narrow lanes in the darnest most uncomfortable humidity. The tedious process of getting stuck in and wiggling through a sea of unknown human bodies is rather unappealing to an adult. But somehow kids love it. I only say it because I used to fancy getting lost. It was scary but oh so exciting. God only knows how many times I’ve gotten lost. That is just so telling of what kind of child I was. Call it a hunger to explore or pure playfulness if you will; only one thing is certain in these scenarios – adults hate it. And you must understand that kids relish anything that adults hate. Perhaps it’s that thrill of being away from your naggy parents (come on, don’t tell me you enjoyed the constant repetitions of ‘hey, stop that’, ‘get back here!’, or the usual ‘you’ll get it from me when you get home!’) and the sheer excitement of being able to go whereever you want. But as with all things exciting, once you realise that you might indeed get lost for real with no chance of getting home (highly unlikely here in Singapore though, it’s such a small island! ), then you’ll start to panic. At this point, excitment turns into anxiety and gleeful eyes turn red and glossy, and your breath quickens as you try to retrace your steps. I am sure that most of you have gone through this at least once. Getting lost is by far no laughing matter especially when your 3ft tall (or short for that matter) frame is at a disadvantage, amidst a sea of tall, lengthy adults. Perfect example – visiting Chinatown during Chinese New Year. Now that’s what I’m talking about. Swarmed with tourists, locals, mums, dads and kids all checking out the various goodies ranging from bak kwa (barbecued minced meat), melon seeds, love letters, pomelos, white rabbit candy (i know it’s now a god-damn poison carrier but hey i loved it! i can still remember the creamy sweet chunk of goo wrapped in edible rice paper, one that i lovingly ate before popping the entire sweet into my mouth), etc. At that time, I believed that a Chinatown experience should be what the Chinese term as being ??. The noisier the better, the more crowded, the more fun it was. The Chinatown crowd is especially fierce during Chinese New Year. Chinese New Year is also not Chinese New Year without that annual trip to Chinatown during the festive period. I still enjoy strolling down the streets of Chinatown and I still get do get lost sometimes but that usually happens only when I head down to the area during Chinese New Year, and Mid-Autumn festival. That’s when the place gets busy and becomes untolerably congested. So congested that you can’t see where your feet are and where you’re headed to. Chinatown has changed quite a bit since my childhood days. It’s cleaner, the roads are wider and even the food centres have undergone an overhaul, making it less dingy and more sanitary. 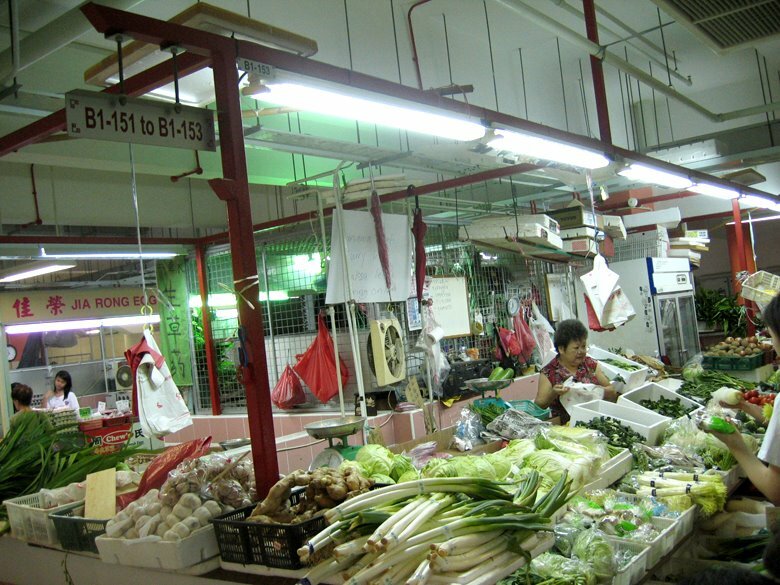 I like the present day Chinatown and I love the fact that it’s chockful of great food at cheaper than cheap prices. Hawker centres (or food centres) are indeed a great blessing. That’s one thing I’m glad we have here in Singapore. There are a few hawker centres in the Chinatown area but my current favourite is the one located right smack towards the end of Smith Street. Oh wait, I just did a quick Google search, it’s at 335 Smith Street. And the proper name’s Chinatown Complex Food Centre. It is apparently also one of the must-visit hawker centres recommended by the Singapore Tourism Board. The last I heard, there are a mind-boggling 200 stalls at this food centre. You can work up an appetite just thinking about it, or actually visiting the glorious food haven to see for yourself what the hawkers have to offer. You have to trust me when I tell you that it is an ultimate buffet spread. There’s everything you can possibly imagine. I reckon that this would be the best place to visit if you have a craving (well even if you don’t, just checking out the stalls will make you salivate). So just what do you crave for? Dim Sum? Yes they have it. Claypot rice? Check. Porridge? Check. 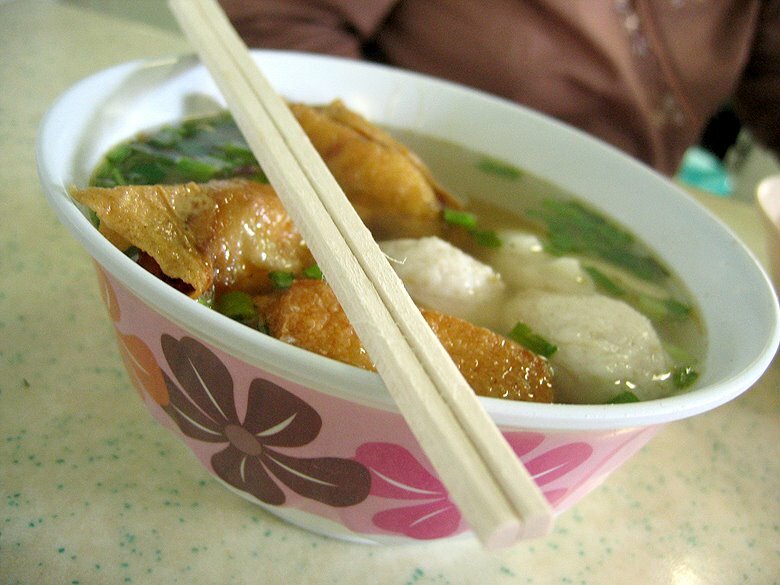 Kway Chap? Check. 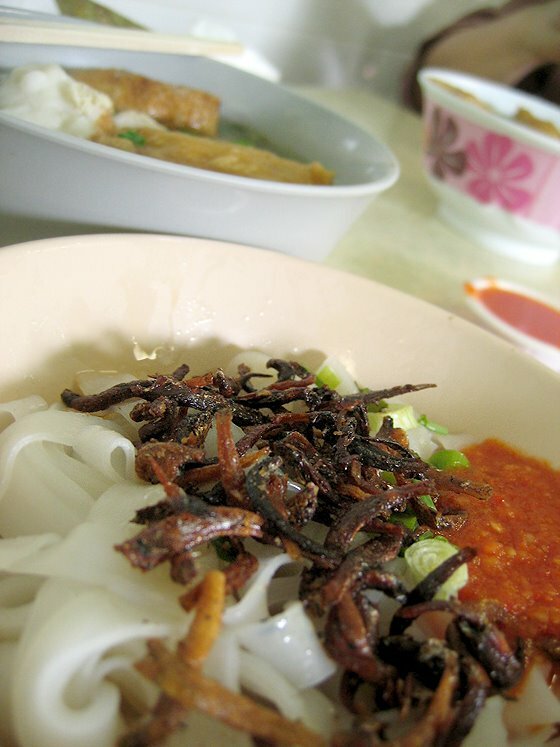 Popiah, fried Hokkien mee and Guo tie? Check. Duck rice? Chicken rice? Banana fritters? Beef noodles? 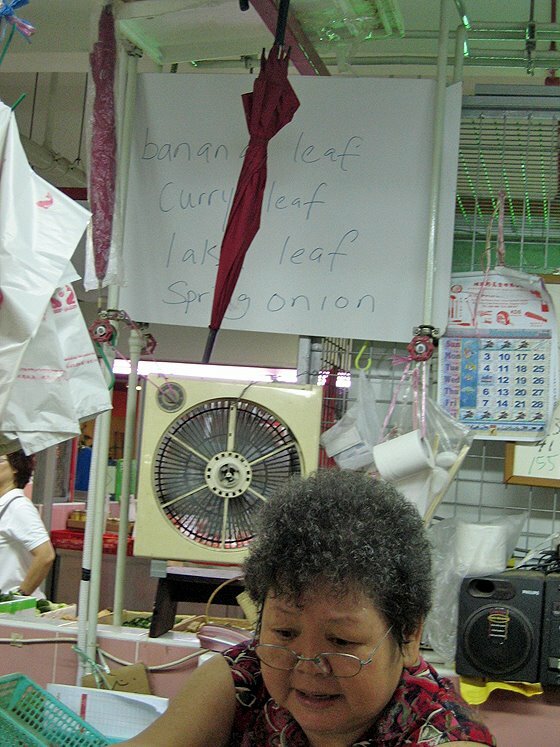 Minced pork noodles? Thick peanut butter toast? Pumpkin sago? Xiao long bao? Yes this place has all of the above. I would love to continue that list but I won’t. I will not spoil the experience for you. That’s because part of the fun lies in getting lost in the maze of food stalls there. No kidding. You have to remember which route you took or else you’ll get lost. I’m speaking from experience. On Sunday, after a very early morning mass (I usually go for the afternoon or evening one but Mum tempted me with a Chinatown brunch adventure of sorts and oh how could I resist? 😀 ), my mum and I headed down to the said food complex to have brunch. Very much intrigued, I was determined to go round the entire food centre at least once to suss out the ‘hot’ stalls plagued by incessant queues. I did all this exploring while my mum did the queuing at one ‘hot’ stall. 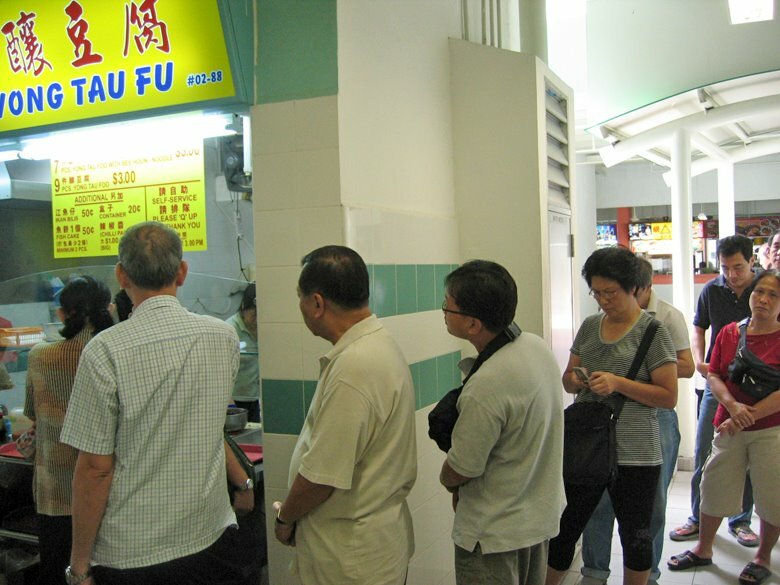 You know a ‘hot’ stall when its queue is ridiculously long. I can say for a fact that this stall had one of the longest queues, and the average waiting time varies from 15 to 30 minutes. My mother first read about this famous stall in the papers a couple of weeks back. Since then she has been patronising the food complex in search for it. She was very determined to try a bowl. I mean come on, yong tau fu is one of the simplest dishes you can find. Isn’t it just some noodles mixed with a broth with pieces of tofu? I thought the exact same thing. I found it silly that my mother would want to queue that long for just some plain yong tau fu. Little did I know that I would soon join the fan club. Okay I feel like having some of that right now. 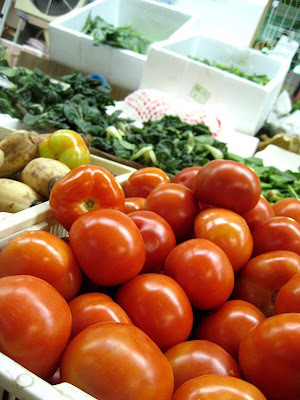 At $3, it is not only cheap but satisfying, and healthy too. That is if you discount the fact that they deep-fried the ikan bilis. It was lovely to watch the vendors at work. This stall occupied two stall spaces and one was solely for assemblage, serving and payment while the other side busied with the cooking and frying of the ingredients. The two halves worked like a well oiled machine and it was a pleasure to watch. There was something about that Sunday that overwhelmed me in a very good and inquisitive way. Food centres are not new to me, I am afterall a big fan of the good ‘ol decent no-fuss meal. I adore a $3 plate of well-made fried hokkien mee, complete with smokey ‘wok hei’. 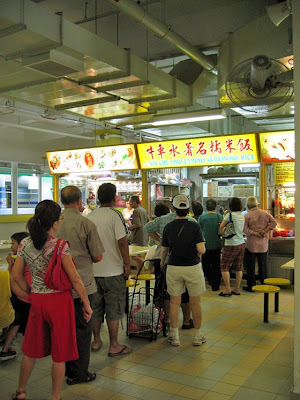 So why the sudden hoo-ha about a visit to a food centre? I don’t know, maybe it was the fact that it was a Sunday and I had all the time in the world to stroll and explore as long as I want. I need not rush because I had no where else I wanted to go to. That’s what made it different. Gogo Beanz must have some of the most delicious soybean combinations I’ve ever seen. 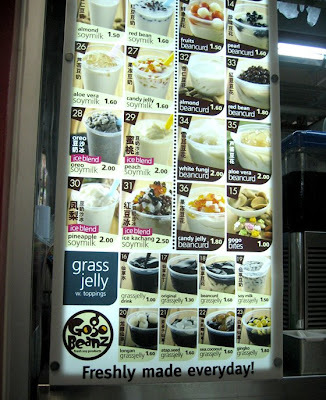 You can have red bean with your soymilk, or aloe vera, or pineapple or candy jelly, or oreo or peach. I tried the one with red bean, which I liked. Well I like anything red bean anyway! They sell glutinous rice. Just the rice, with some fried shallots, some sesame oil and a light dash of sauce (light soy i think!). Their queue is one of the longest. As curious as I was, I wasn’t patient enough to stand in line (which was a smart move because soon after I took the photo, half the queue was forced to leave empty-handed because they had run out of rice). So if you have tried their glutinous rice, pray, do tell. I’m curious. It must be so good, considering that it looks rather plain. But as I have learnt that day – plain looking food (yong tau fu included) can be as delicious as anything. After I was done exploring the food centre, I went to the basement together with my mum to buy some groceries. I needed to get some sweet potatoes for a sweet potato bundt cake I wanted to make. Martha Stewart featured it on her Thanksgiving special. I promise that she wasn’t trying to throw that huge aubergine at my mum. But I am sure she was gesticulating while my mum tried to bargain for a better price. As much as I fancy supermarkets and their sanitary clingwrapped meats and prepacked vegetables, I still find wet markets a pleasure to visit. It is very much an adventure and that Sunday I renewed my love for wet marketing. This vegetable bewildered me. It looked like something that belonged to the ocean, or perhaps another planet. I thought it resembled a coral. Beautiful ain’t it? Care to guess what it was? You’ll find out… soon. I know some people have trouble finding those leaves so I thought I should highlight this fact. Now you know where to find them. That’s the entire stall. Such a jovial chatty lady. I will be back for sure. After grocery shopping, mum and I (being the gluttons we were), had to get some dessert. 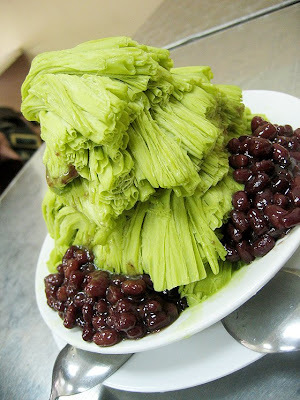 We shared a green tea snow ice dessert with red beans. tables. Well yes it did, but it tasted nothing like it of course. This was a light and refreshing dessert, perfect for the two of us. I forgot to take down the name of the shop. All I know is that it’s the famous warm dessert shop that’s known for their mango pomelo sago as well as their walnut cream, almond cream and black sesame cream. Oh and Cantonese dumplings. It is quite easy to find this shop if you know where the CK departmental store is. The shop sits on the same street that CK is on, and it’s at the start of that street. I’ll update when I find out the exact name and location. Back to Exhibit A. Did you manage to guess what it was? I actually thought that it was just a different breed of cauliflower. 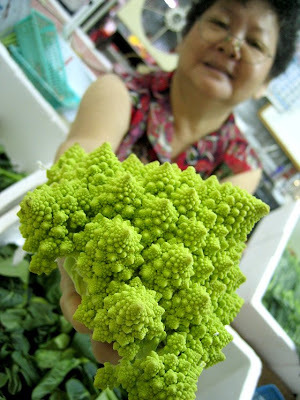 I believe it is also called a Romanesco cauliflower. It also tasted more like cauliflower. Whatever it is, it is a marvel in itself. A true art-work of mother nature. The main pattern it follows is known as a fractal form, referring to its self similar pattern throughout the florets. 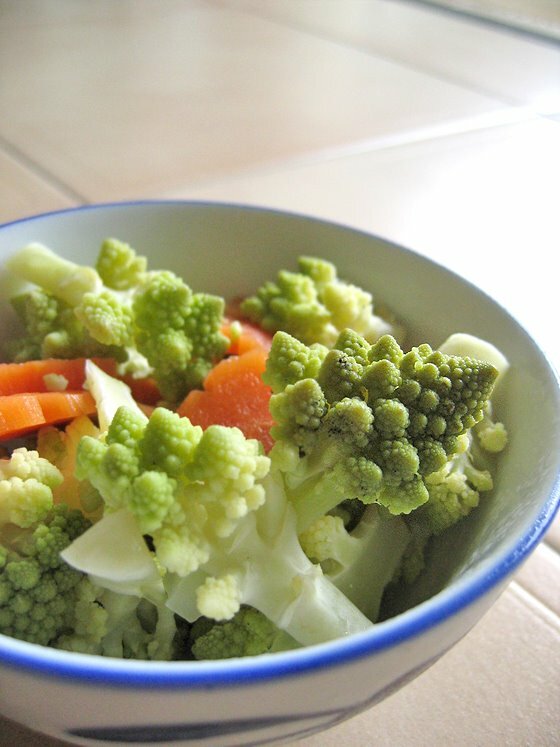 The Romanesco broccoli is rather intriguing I must say, but perfect if you want to generate buzz at a dinner party. 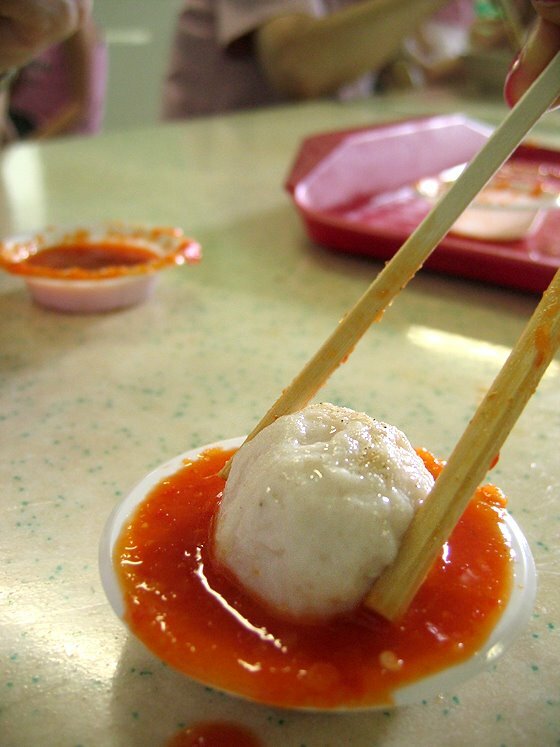 If you’re ever bored of the countless malls and cannot take one more chill-out session at Starbucks or Spinelli’s, then you should try heading to Chinatown for a fun day of good and cheap eats. Don’t forget to get lost along the way. That is after all the essence of Chinatown – to stumble upon treasures you never knew existed. 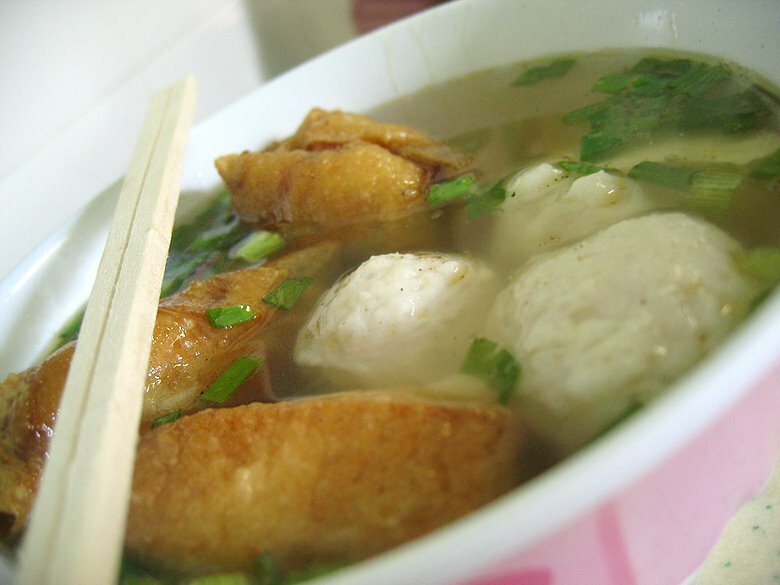 that looks like gu chai pek. 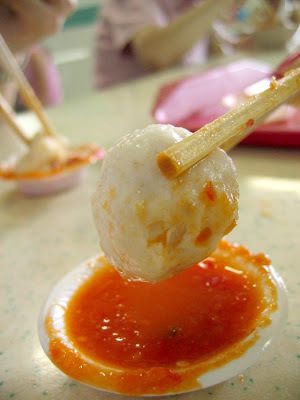 Ah..the glutinous rice stall. IF its the supposedly famous one, there should be two versions of it- sweet and savoury. The sweet one is a sickly mess of sugar which will send you into diabetic shock. The savoury one isnt that great either. Can’t figure out whats the hype about. But try combining the two, it makes for an interesting treat. 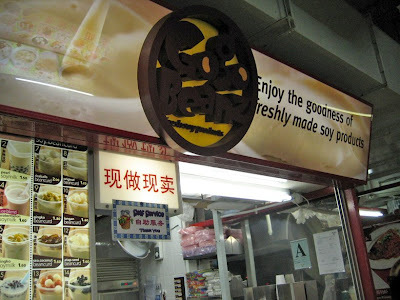 That dessert stall is at temple street… can’t remember the exact name too but be sure to try their smooth pastes and the mango pomelo dessert! Hello! The dessert stall is called Mei Heong Yuen. Anonymous is right — they are garlic chives that have been forced (blanched). It’s the same process used for asparagus and endives. What a wonderful day that must have been! Amazing! 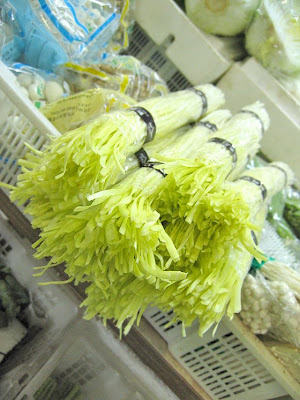 I saw that weird looking vege at Jusco supermarket and they call it Broccoflower ! ( mixture of broccoli and cauliflower ) It looks pretty creepy. 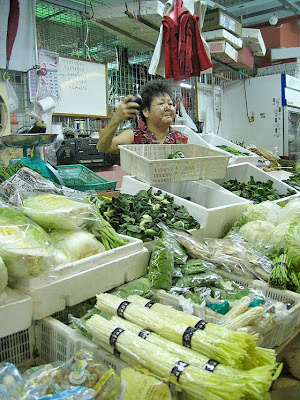 I grew up in chinatown when my dad helped out at my grandmother’s stall selling clothes where it was a labyrinth. But after a while, you can tell which stall is at which corner, and everyone knew who’s kid was whose so no one ever really gets lost. There was a real community spirit akin to the kampong days. 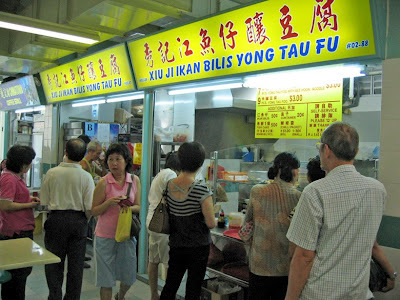 Yes, Xiu Ji YTF (My short form for yong tau foo) is also known as ‘Ha Ka Lo yong tau foo’ in cantonese, the old stalwart who used to tend to this stall, it used to be a 6am opening and they close at 12noon or the record time i heard was that they closed at 10am coz all was sold out! It tastes still as yummy today with his children taking over the stall. And yes, the charm of hawker centers and wet markets will always be in our blood eh? I’m visiting Singapore next January, can’t wait to go to that soybean stall !